The Meditub 3054 is a uniquely designed reinforced fiberglass acrylic walk in tub with a side door. It allows for installation in small areas such as a shower stall, mobile home, closet or a laundry room. Just sit down and be embraced by the warmth and healing from your new tub from Meditub™. This tub incorporates a stainless steel frame for long lasting strength and adjustable feet for easy installation and leveling. 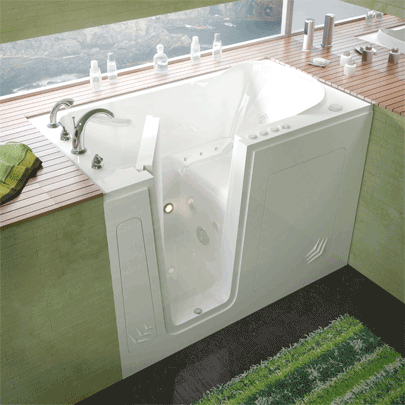 Dual Massage System combines Hydro & Air System to provide a truly luxurious bathing experience. 1 horse power pump with directional water jets. The Deluxe whirlpool massage system includes (h_jet) 360° color matched, directional and adjustable water jets. Each individual water jet is also fully adjustable as far as pressure or velocity of water also included is a FREE Inline Heater which maintains a consistent water temperature, rated at 15 Amps 125 Volts AC, 1 Nema Plug.